Purchase Your W.A.C. Safety Package! How effective is the W.A.C.® whistle? The unit for measuring sound intensity level is called a decibel. There are a lot of different types of whistles that make sounds at a variety of decibels. These sounds were ineffective because they were too low or too high and could cause ear damage. The W.A.C.® signal whistle is exclusive to our W.A.C.® Safety Program. Per the League of Hard of Hearing, "Standards set by OSHA (Occupational Safety and Health Administration) indicate that continued exposure to noise over 85 dBA will eventually harm your hearing. The exposure time allowed is cut in half for every 5 decibel increase. For example, if a sound is 95 dBA, then 4 hours of exposure, over time, could cause hearing loss, and exposure to sounds at 115 dBA for just 15 minutes a day will cause hearing loss." 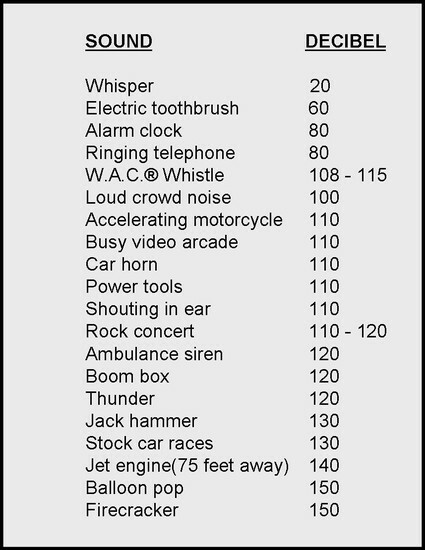 The W.A.C.® signal whistle tests at 108-115 decibels. This is a range safe for children's ears. We chose this decibel range to meet two factors; effectiveness of cound range over distrance, and the limitation of a child to blow the whistle for an extended period of time adequate to harm another childs's ears. Our whistles are effective during many times of danger including but not limited to: Lost in the woods, lost while shopping, lost in a parking lot, scaring wild and domestic animals away, abductions, attempted assaults, boating, medical emergencies and many more uses. There are incendents where people who have used the whistle to save their lives. One case was where an elderly woman with congestive heart failure was saved when all she was able to do was blow her whistle to signal for help.